The international community is not living up to the commitments it has made and women in conflict are paying the price. 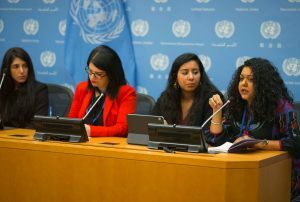 This was the message from women’s rights activists from the Arab region at a press conference held at the United Nations during the 63rd Commission on the Status of Women in New York (CSW63). Activists from Lebanon, Libya, Palestine, Sudan, and Tunisia spoke as part of the Karama women’s movement. They discussed the impact of the Women, Peace and Security agenda, established by UN Security Council Resolution 1325 nearly twenty years ago. Statement from Hibaaq Osman, Founder of CEO of Karama. It is our great pleasure to address you today on the women, peace and security agenda in the Arab region. Thank you for attending, and thank you to the Permanent Mission of Ireland to the United Nations for hosting this briefing. Ireland continues to demonstrate great commitment to promoting women’s participation, working with women activists, and offering practical support to women to ensure that they have their rightful platform. We thank the Irish Mission for their incredible support. Next year will see a series of notable anniversaries for global women’s movements. It will be 25 years since the Beijing Declaration, 20 years since the agreement of UN Security Council Resolution 1325, and plans are well under way to mark these occasions. But there is no time like the present, and women in the Arab region cannot wait any longer for national governments and the international community to live up to the commitments they have made years, and now decades ago. The women, peace and security agenda was established because we know that women suffer disproportionately in conflict and under occupation. We will hear today from activists from a region that plays host to a disproportionate amount of the world’s conflicts and instability. Despite the numerous countries experiencing conflict, prosecuting conflicts, and experiencing the effects of conflicts on their borders, very few countries in the Arab region have attempted to implement the women, peace and security agenda. Only three countries have agreed national action plans for the implementation of 1325 – Iraq, Palestine, and most recently, Jordan. Activists demanding their own governments take often hear contradictory excuses. Governments in countries not experiencing conflict claim the agenda is only relevant for countries at war. On the other hand, countries experiencing conflict or states of emergency point to crisis as a reason for their inaction. UNSCR 1325 and each of the seven related resolutions were all passed unanimously by the Security Council. The women, peace and security agenda is one for every country, no excuses. Even where we have seen steps to implement the agenda, there are worrying signs of depoliticization. The international community is often far happier and far more keen to support implementation plans that complement their own national security interests. UNSCR 1325 set a transformative agenda. Fundamentally it was meant to make a difference to women affected by conflict. If it does not focus on those women, it is not a women’s agenda. We are proud today to present women who are and have been at the forefront of activism in the Arab region. We might have had the opportunity to hear from more even countries, but a number of activists have been prevented from being here today by restrictive visa processes. It is a struggle enough for women to be able to participate meaningfully in peace and diplomatic processes – and the simple process of securing visas is further reducing the platforms available to women who have dedicated their lives to building peace in their communities and globally. It is a great injustice.